With the increase in the number of people suffering from the condition of myopia, SEED contact lenses company has decided to take an initiative to further propagate the cause of vision correction. VisionPlus speaks to the CEO of the company on the challenges faced by them and their strategy to penetrate different markets with different needs for vision correction. VisionPlus (VP): How did you get interested in the domain of optical trade? Masahiro Uraklabe (MU): I spent 25 years in the finance segment after I graduated in Japan. I worked in the domain of international banking in Tokyo and then moved to corporate banking. As much as I enjoyed banking as a career, I was interested in human resources as well. I believed that the idea of import and export was quite durable for me, it appealed to me. To manage one side of management sector in the banking business. I was recommended to the company by one of my fellow mates who earlier assigned me a task to find someone suitable to handle the management of the firm. Instead of that, I was the part of company’s management. In 2018, I have completed 8 years here. VP: The market for contact lenses has undergone quite a few changes, what is your opinion on this? Are there any unique issues for eyes for different region? MU: In Asia, we aim to reach out across markets in China. Chinese people give us the benefit of the language. Similarly Mongolians, Japanese and the Koreans. People in these counties have a high degree of Myopia. In fact, the ratio of Myopia in higher in all these countries as compared to Japan. According to the health minister, 60 percent of the high school students have Myopia, this ratio is even higher in China. In Belgium, for example, 80 percent of student population suffers from the condition of Myopia. So the distribution and degree of contact lens differ and hence the market is divided. We are also penetrating in India. But with all these countries, there are different regulations to pass the requirements, medically, and then sell your product in the market. Given this background, I think it would be fair to say that we are reaching out to multiple markets in and across Asia. VP: Which product out of all in your portfolio is a better revenue generator? MU: At the moment, in terms of revenue generation, the daily disposable lenses are a major attraction for us. This is because people in China, Thailand and Malaysia demand these lenses. Even the cosmetic lenses have seen a fair rise in their demand in Thailand. But all these countries have a higher usage of contact lenses as compared to other countries. An average contact lens user in these countries is a 20-years-old person, specially asking for the cosmetic range. For example, for people with higher degree of Myopia, the daily disposable lenses of SEED can adjust upto -16 as well as -24 dioptre which is highly useful for people who suffer from such conditions. VP: Do you claim that SEED is one of the largest contact lens manufacturers in the world, what in your opinion are the key differentiating factors? MU: I wouldn’t claim that SEED is the largest. There are many American and European companies that are bigger than us. However, we have a vivid presence in the Asian markets, namely, Thailand, China and of course, Japan being our home country. We are producing well for these countries in the range of daily disposable and cosmetic lenses, depending upon the demand. Our supply matches the ratio. But yes, we rank 19 in the world and this is why we are the largest Japanese manufacturer of contact lenses specially, the daily disposable range. VP: SEED seems to focus extensively on research. How has this helped in giving you insights to try and stay ahead of the competition? MU: In order to maintain a global presence, I believe it is a must to know each and every market like its your home market. The markets these days are really tough to crack, they are digitally well equipped and there are many competitors in each region. To be fair, every country has one brand which is treated as number one but that is not the same for the brand from a different county. This is what we need to tackle in each country. The key requirement is to cater to the increasing needs of the market by knowing it and understanding it well. As a distributor, we always ensure ample modification in our products to suit the requirements of the local population. And the changes are not just in the product but also in the process of distribution. VP: Are contact lenses a commercially feasible proposition for opticians as compared to eyewear? MU: Yes, the contact lens are a commercially feasible proposition for the opticians and this is increasing with time. An optician can sell the glasses rather than contact lenses. However, in my opinion, such transactions are limited and nobody approaches a seller for more than once or twice when buying spectacles. In case of contact lenses, if it is the monthly disposable ones, every three to six months the customer has to buy it. In case of daily disposable lenses, the customer has to buy it daily and therefore they are likely to develop the loyalty towards one particular optician. It is both good for the business option and goodwill that the store owner gets. After all, the possibility of frequent visits to a shop is higher when an optician is selling contact lenses. VP: What are the markets that you are currently targeting and how do you see this presence grow in the next few years? MU: We started to ship our products to countries like India, Portugal and many Gulf countries. In terms of the total size of population, India is our next big target as a lot of them use contact lenses and are much more about the advancements and requirement for a clear vision. Also, in India we see a lot of opportunities for SEED. Especially, for the daily disposable lens category, they will sell more here in comparison to other countries and regions. 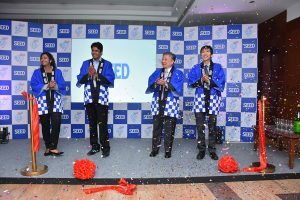 SEED Co., Ltd from Japan launched their SEED 1day Pure series of contact lenses at Lalit Hotel,Mumbai on March 7, 2018. SEED launched a complete range of Made In Japan 1Day contact lens products for spherical, astigmatism and presbyopia patients. 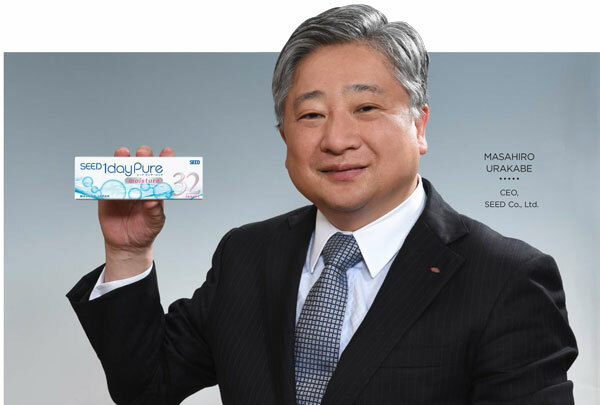 Mr. Masahiro Urakabe, President and CEO of SEED Co., Ltd was personally here to launch the SEED contact lenses. 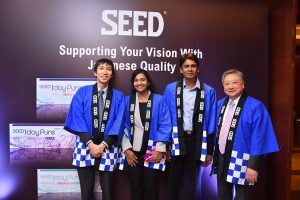 With this launch, the SEED contact lenses range is now available in India. 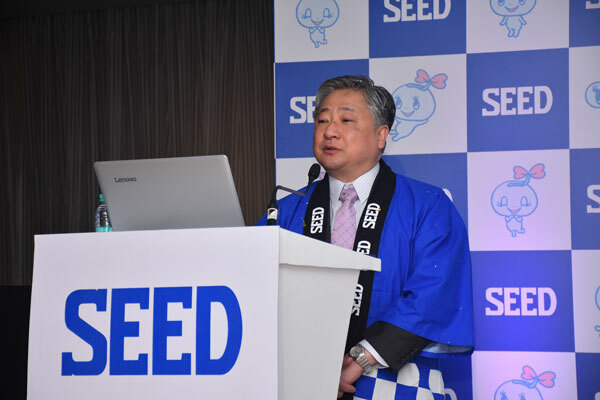 Commenting on the launch, Mr.Urakabe said,”Over 30 representatives from different shops attended the event which allowed us to share the unique features of SEED contact lens to some of the leading eye care practitioners from all over India”.